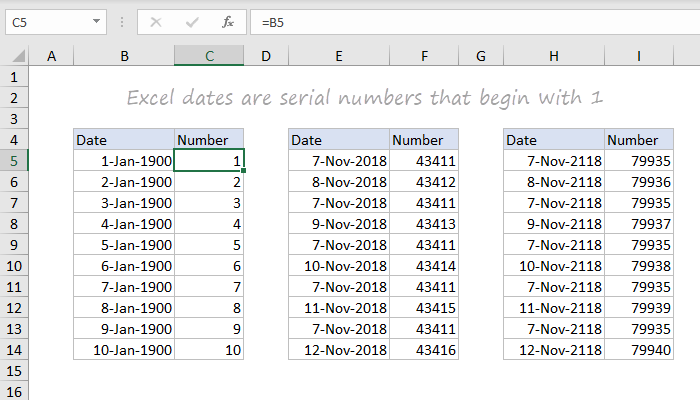 In Excel's date system, dates are serial numbers. January 1, 1900 is number 1, January 2, 1900 is number 2, and so on. More recent dates are much larger numbers. For example, January 1, 1999 is 36161, and January 1, 2010 is 40179. Because dates are just numbers, you can easily perform arithmetic on dates. Because Excel dates are serial numbers, you'll sometimes see these numbers on a worksheet when you expect a date. To display date values in a human-readable date format, apply a number format of your choice. To check that Excel is correctly recognizing a date, you can temporarily format the date as a number. If Excel doesn't display the date as a number it means the date is not correctly recognized. A common problem in Excel is that dates are not correctly recognized, usually because Excel thinks the dates are text. This article explains various ways to convert text values to proper dates. Note: Excel will only handle dates after 1/1/1900.